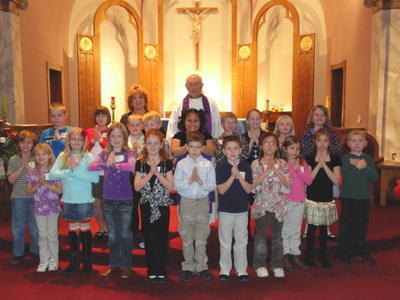 Eighteen second graders of Holy Rosary received the Sacrament of Reconciliation on Sunday, December 12th during the Communal Reconciliation Service. 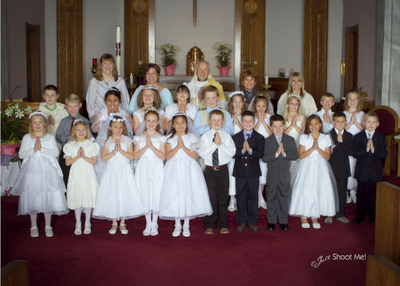 They are: Allison Montgomery, Aubree Shrewsbury, Mika Brown, Sophie Standage, Stella Beck, Maslin Breen, Reese Armstrong, Olivia Krejci, Peyton Daniels, Gavin Mann, Danny Jelinek, Liam Romero, Curtis DeBaca, Cisco Cody, Tripp Johnson, Phoenix Red Nest, Joe Collins, Kason Loper, Catechists Nancy Vogl, Samantha Montgomery, Fr. Tim Stoner, & Pam Cyza. Children in the second grade are prepared for First Reconciliation in the Fall and celebrate the sacrament before Christmas. The children are then prepared for First Eucharist in the Spring and celebrate the sacrament on the Sunday following Easter. 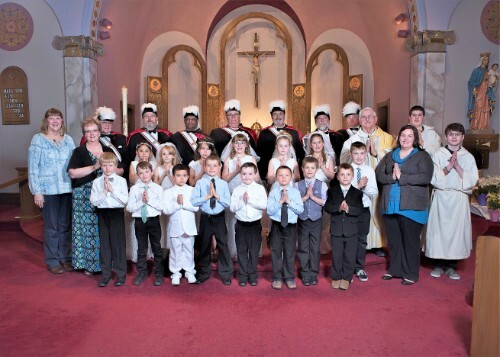 Parents and god-parents are asked to take a pre-baptismal class before their child is baptized. Couples are asked to begin their preparation for the sacrament of marriage at least four months before the proposed date.